After a week without my favorite combo..yes: sugar and carbs...I've gotten some pregnant woman - level cravings for random pastries. Yesterday, it was one of my all time seasonal favorites - the Starbuck's pumpkin loaf. So, I got inspired and decided to experiment a little and come up with a breakfast muffin that I can grab on the way to work throughout the week, since I am so terrible at motivating myself to cook in the mornings (cook or sleep in an extra half hour?...the decision is always an obvious one come early morning). Compared to the Starbucks Pumpkin Loaf, this recipe saves you more than 150 calories and has half the carbs, while being a lot more filling. So stay away from that magical green mermaid (or whatever she is) and go for a cheaper, healthier option. 1) Preheat oven to 350 degrees. Spray a cupcake pan with non-stick cooking spray/oil or fill with muffin liners. 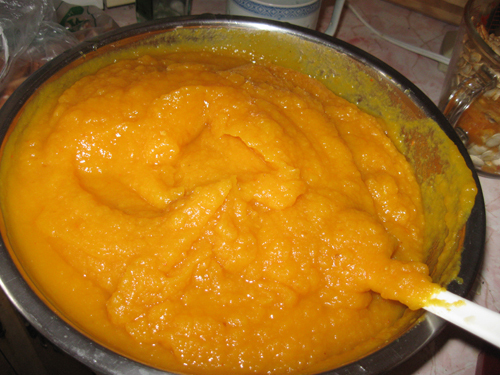 2) Mix together the flaxmeal, walnuts, pumpkin puree, salt, sugar, and baking soda in a large bowl. Beat eggs on the side until thoroughly mixed, then add in to dry mixture with melted butter and stir well until consistency is smooth. 3) Mix in cherries, cinnamon, nutmeg, and vanilla. Taste, then add in more sugar, etc. according to preference. 4) Pour into muffin/cupcake pan and bake for 30 minutes, or until knife inserted into the middle of muffin comes out clean.